Chairperson Erica Ngiam kicked off the show with a brief introduction to jazz music for the uninitiated. Unlike their mid-year concert, Take My Word For It, this concert was held in the style of an open jamming session that proved just as good a platform for showcasing the Jazzers’ spontaneous creativity and remarkable talent. Erica opened the concert with a brief introduction to jazz music. Vice-chairperson Elaine explained to us, “The essence of jazz is soloing, improvisation and the freedom of expression – to make the song, as much as possible, your own, and to share this interpretation with the audience to foster a connection.” Accordingly, jazz music typically begins with all performers playing the ‘head’ to the song, followed by a series of improvised solos. The first band that evening played Quando Quando Quando. From left to right: bassist Zhu Weijie, drummer Elaine Wijaya, trombonist Heng Jia Min, vocalist Devni, guitarist Sharon Saik, keyboardist Zhi Wei. The 8-piece setlist incorporated a variety of songs ranging from Bye Bye Blackbird, performed in a swing style, to My Funny Valentine, a vocals-heavy ballad. 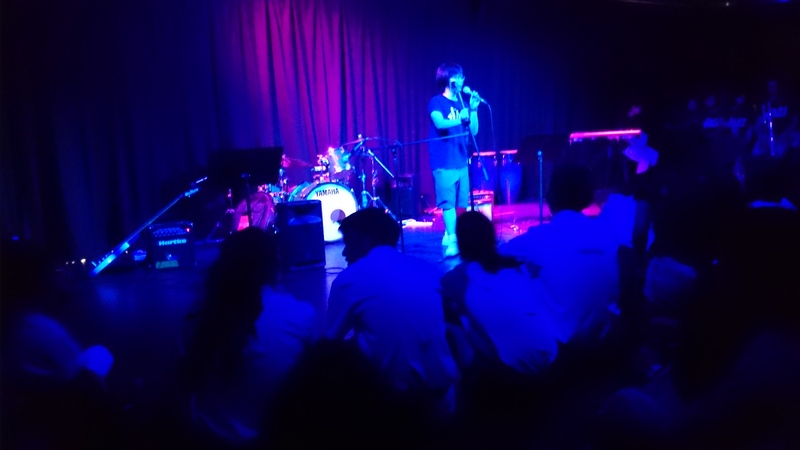 Throughout the entire performance, we were struck by the camaraderie and chemistry between performers, as well as the confidence with which they executed their respective parts – keyboardist Debbie Ng’s unexpected, mischievous addition to the end of Bye Bye Blackbird drew good-natured groans from her bandmates and laughter from the crowd. Nor did the Jazzers’ skill go unnoticed – Joyce Lim’s dexterous clarinet solos in Wave by Antonio Carlos Jobim and There Will Never Be Another You were enthusiastically received, as were Stefanus Phan and Saaradha’s velveteen vocals in Wave and My Funny Valentine respectively. The modest crowd that day made up for what they lacked in numbers in energy. Despite jazz music’s reputation for being somewhat highbrow and inaccessible, the audience that day seemed to embrace the music with open arms, helped along no doubt by the Jazzers’ informal vibe, and frequently shouted encouragement to their friends, rewarding each performance with a hearty round of applause. The Jazzers rounded off the concert with Hit the Road Jack and Bag’s Groove, both played in the style of a typical Jazz jamming session. Erica explained to the audience, “We basically play the head once and then pass the solo on […] until we get tired.” This segment proved to be a crowd favourite and was noticeably more free-form, with the catchy tempo accelerating at moments in Hit the Road Jack, prompting the audience to clap along to the beat as vocalist Stefanus belted the high notes of the chorus. We were also impressed by keyboardists Erica and Lee Ann Gie’s upbeat, dexterous improvisations, which lent the songs a wonderfully eccentric, offbeat flavour. Erica later remarked, “I personally felt that the jamming session was really a great segment to have because the audience could really see for themselves how our usual band practice goes and how Jazz really is about spontaneity, creativity, active listening and band chemistry.” Indeed, the predominant impression we were left with was the Jazzers’ strong passion for their art, and the diversity within their tightly-knit community. 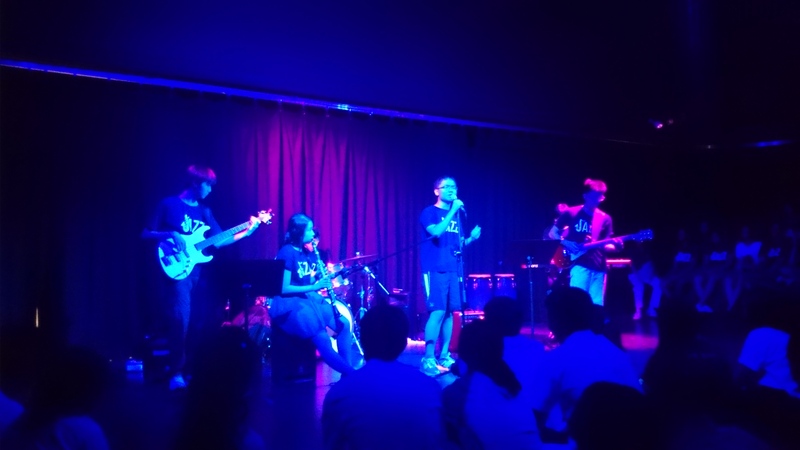 The band that played Hit The Road Jack comprised bassist Gabriel Ng, clarinetist Joyce Lim, drummer Shaun Mak, vocalist Stefanus Phan, guitarist Mitchell Kwong and keyboardist Erica Ngiam. Audience members seemed to concur. 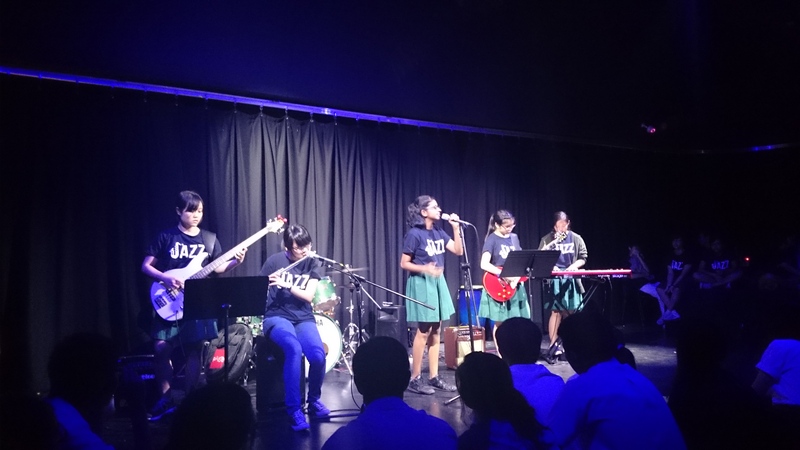 Said Neo Jin Hong, a drummer from Raffles Rock, “I attended the jazz concert expecting a great exhibition of music and showmanship and I was not disappointed. 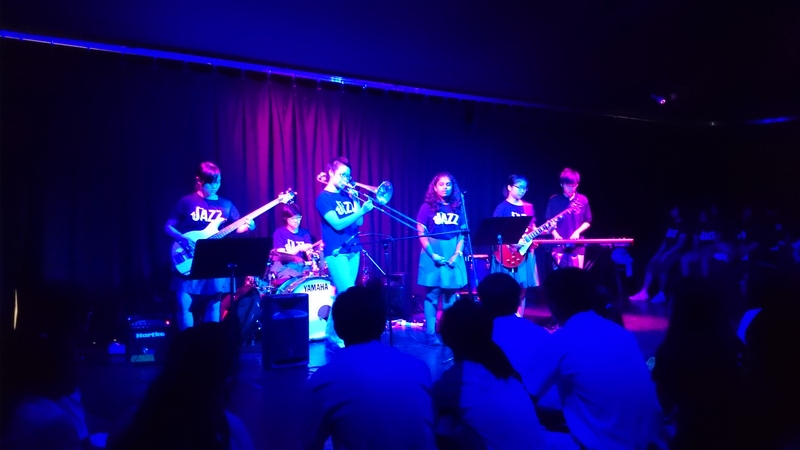 I especially loved the final jam session!” Those who had a good time will be pleased to know that Raffles Jazz plans to hold more of such open jamming sessions in future for Rafflesians’ enjoyment and as good exposure for their members. Their next session is slated to happen just after PW concludes, so if you’re eager for another hour of relaxing jazz with your friends, do swing by!